R.F. Mau Company is a family-owned and operated job shop serving the needs of our customers for over 80 years. Specializing in the precision machining of brass, copper, and aluminum alloys, R.F. Mau Co. offers advantages you won't find anywhere else. With more than 40 New Britain, Tornos, and Euroturn multiple-spindle screw machines, we are uniquely positioned to handle your high-volume production requirements for both large and small diameter parts. Combined with our full complement of MSO, HAAS, and Daewoo machines, we're ready to handle your most demanding parts. Our fully-automated scrap handling system teams with our "green-certified" automated parts cleaning system to assure that your parts will be delivered clean and dry, free of all oil and chips. R.F. Mau Co specializes in screw machining production runs of medium to high volume. Machining capabilities range from .1875" to 2.250" diameters using multi-spindle screw machines. Production and Quality Control personnel work as a team to insure your parts are manufactured to print and delivered on-time, with the assurance that your job has been done right the first time - every time. Most important, our high-volume production capability and purchasing strength allow us to manufacture parts at significantly lower price than our competitors - cost savings that we pass directly on to you. R.F. 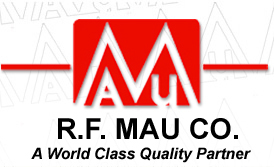 Mau Co. - your one-stop specialist for non-ferrous precision machined parts.